In February of this year I installed a 12,000 BTU air conditioner in Gimme Shelter. The process was surprisingly painless. It almost seemed TOO easy. Fast forward to the heat of the summer and suddenly we have water dripping out of our hanging closet where I installed the unit. The line that should have been draining condensation out of the pan, while routed in the best manner possible without drilling more holes in the boat, just wasn’t draining. I’ll admit, I put this problem off for months. I just didn’t want to take everything apart again and deal with the hoses in the tiny, crowded space. I finally tackled it last weekend. My original plan was to remove the drain hose and add an elbow right off the spout, so that I removed the first pinch point. Then I was going to drill a hole in the floor of the closet and run the hose straight down through that hole to maximize drainage. Problem solved, right? Well, my first issue arose when I couldn’t get the drain hose off. After ten minutes of pulling and twisting, I resorted to a razor. Then I couldn’t get the new short hose with the 90-degree elbow back on. That was another twenty minute struggle. Then I tried to fit the drill in the closet, and I couldn’t get it in as far as I had hoped, but I drilled hole anyway. It was somewhere during this battle that either a hose clamp or some metal flashing on the unit sliced open my first finger. It wasn’t a deep cut, but it bled like crazy. Mary insisted on some first aid and bandaged it up for me. 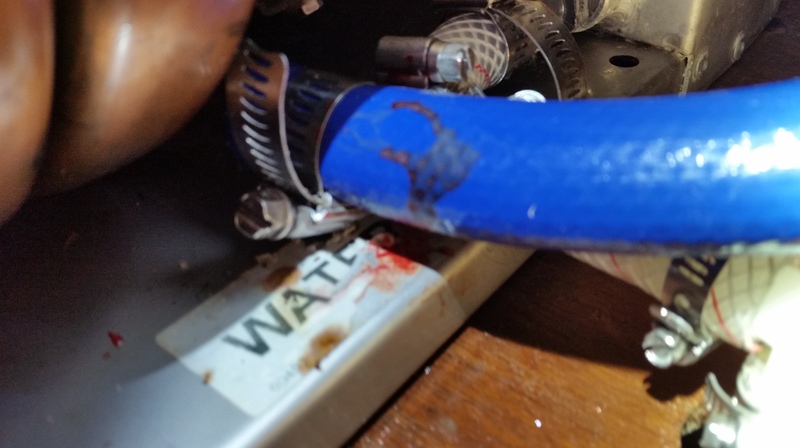 Then to add insult to the injury, I found that with the drain hose now connected to the new elbow and running down through the hole, it now had a new kink and still didn’t drain. It was off to West Marine to buy a second elbow. Then it was back to the boat to further disassemble the AC unit until it could be lifted and shifted out of the way to drill a second hole in the floor in a better spot. After another 30 minutes of struggle and two more slices in my other fingers. I was able to put everything back into place and screw it all back down. As Mary once again administered first aid and applied more band-aids to my hand, I realized why the AC had not been draining properly. 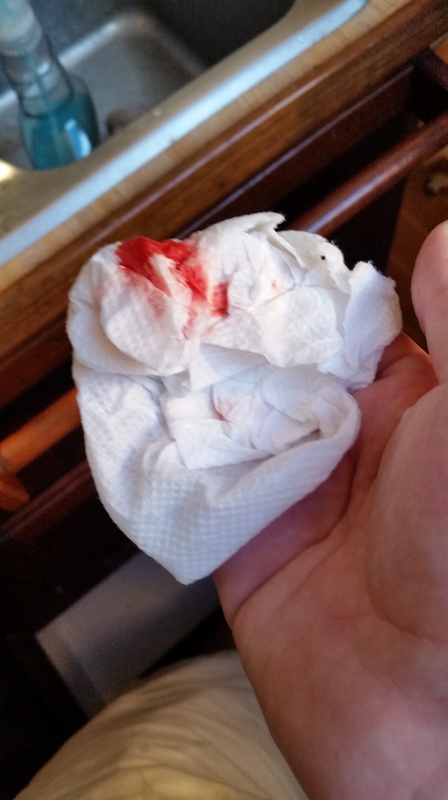 I had not completed the required blood sacrifice during the job. At this point, I firmly believe unless there is blood shed during a project, it will not succeed. The Mayans knew it all along. But at least now the AC condensation is draining properly.